So is it a Christmas book, or is it a thriller? I'm confused. Both! All Kris Collins wants for Christmas is to survive. With everyone from a ruthless assassin to the FBI, and even his ex-father-in-law after him, it almost makes him long for his days in prison. It all comes to head in a Christmas Eve showdown, with it still unclear whether Kris will end up on the "naughty" or "nice" list. But the one thing he does know is that for him to make it to Christmas morning, he will have to write a new chapter in a classic tale. Also includes many seasonal themes - giving, belief, redemption. And that Santa Claus might not necessarily be confined to one man, but a spirit that is within everyone. But shouldn't the July book of the month be a beach read? I think it makes a great beach read. Fun characters, good action. Christmas in July - it's like a frosty beverage on a hot day! What are readers saying about it? The reader reviews have been excellent - as of today: 5-star average at Barnes & Noble, 4.9 average at Amazon UK (love the Brits! ), 4+ at Apple, and nothing less than 4-stars at Amazon. BUT!!! That is based on a very small sample size - only 3 reviews each at B&N and Amazon, 8 at AmzUK, and 14 ratings at Apple. The amount of reviews usually is in line with the amount the book has been read - for instance Officer Jones has almost 600 reviews at Amazon alone, and Painless has been rated in the thousands at Apple - so basically, folks haven't gotten into the Kristmas spirit yet, but those who have really have liked it! Why a Christmas themed book? I had seen a program a few years back on how the story of Santa had changed over the years - that it wasn't a stagnant tale that remained stable from the beginning of time. And that the modern American version of Santa came mostly from the 1809 Washington Irving book "The History of New York." Before that, Santa Claus never had a flying sleigh, filled stockings hung by the fireplace, or had that famous belly. So I grew interested in how the story of Santa would be written today, especially in a society that would now look suspiciously at an older man providing goodies to children, and where anti-heroes are often celebrated in our entertainment characters (See: Tony Soprano, Walter White, Don Draper). I thought the modern day Santa would be edgier, and faced with more challenges when it came to family structures and economic realities, but still maintaining the core values that have made his story so enduring. So Kristmas Collins became my take on what a modern day Santa might be like if written today. I love the cover, but is Santa ... No, no, no Santa is not "relieving himself" on the front stoop, as a couple readers have mentioned to me. Santa would never do something like that, but this Santa would break in when you've left for the evening. P.S. The cover is the talented work of Carl Graves who did a great job as always. 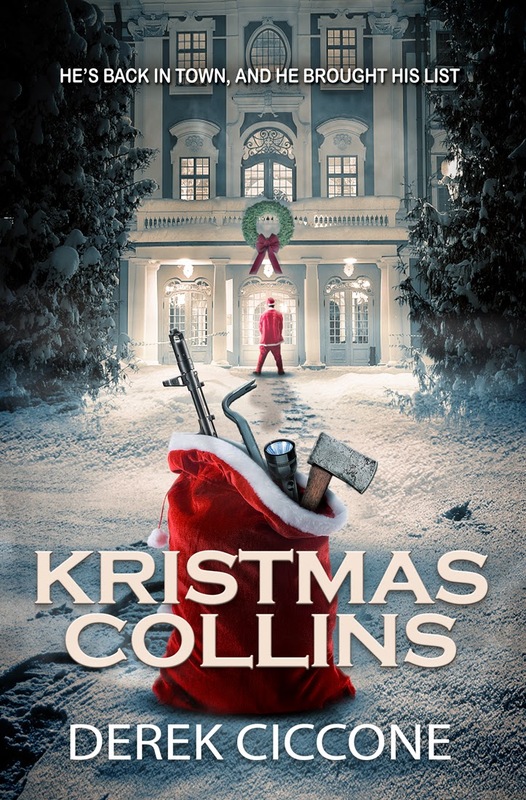 Kristmas Collins is currently available at Amazon, Apple, Barnes & Noble, and most online booksellers, as both an ebook and a paperback.